On Steam there is a sale, that includes Kingpin that is on sale with 30% off, for 6.99, until 6 February Steam time. 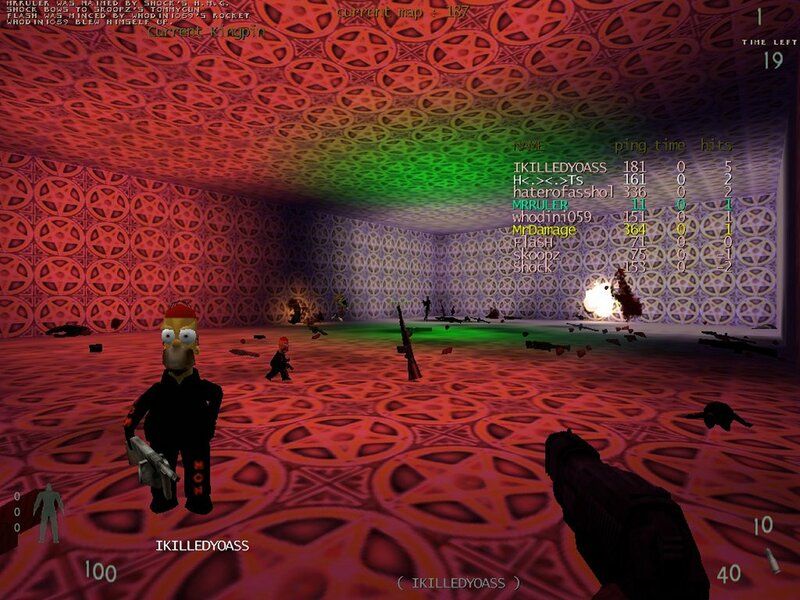 Just a reminder that we host a map pack containing all known Bagman maps which was compiled by Fredz. I'm reposting news as there are still many people who have to download a majority of maps from the servers. 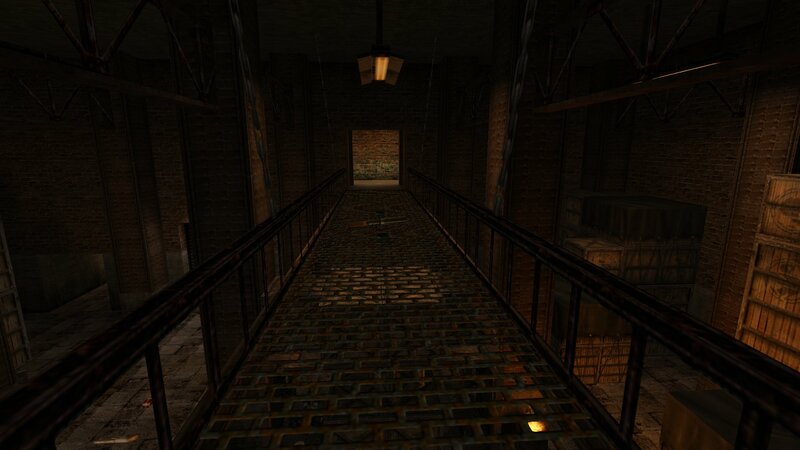 It's around 320mg and you can download the Bagman map pack from here. Another game of Bagman planned for this Sunday stating 9pm UK time. Well are you coming along for a game? 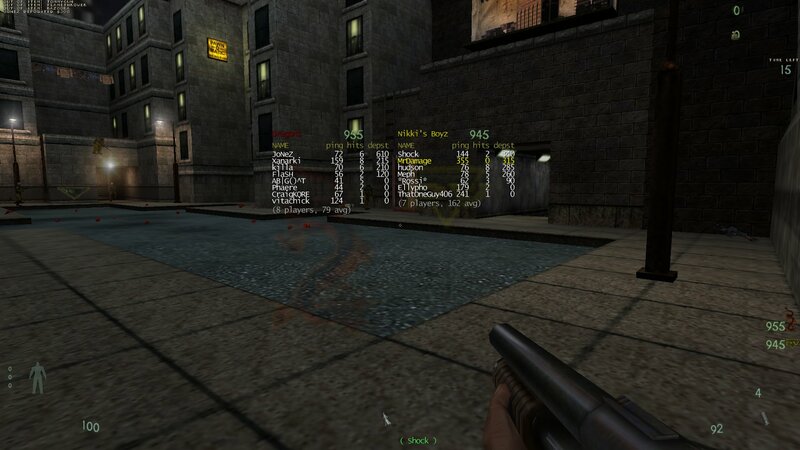 Here is a death match map from way back in 2000 called Sewage Treatment (comakp1.bsp). 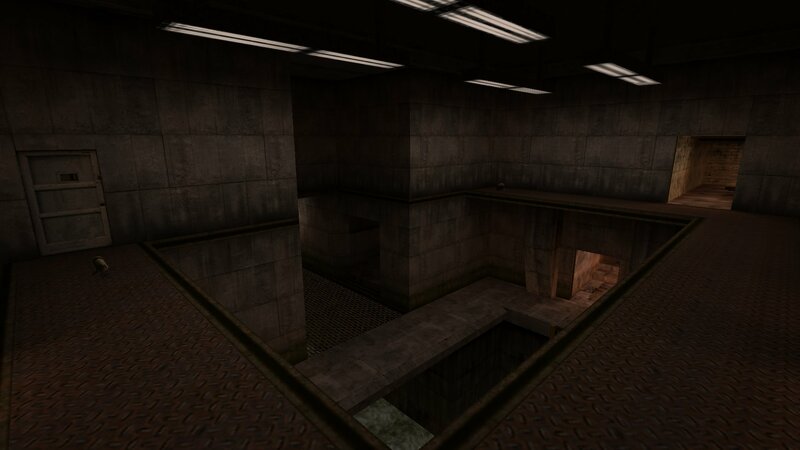 As the name suggests the map is set in a sewage treatment plant. 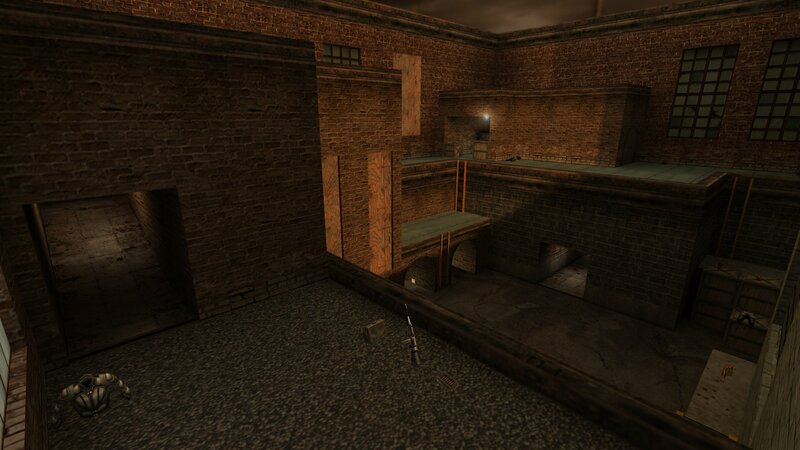 It's a largish map with several areas and has ample weapons and items but it does only have 8 player spawns. You can download Sewage Treatment (comakp1.bsp0 from here. Stroppa made a Gansta Custom Sounds pak which replaces the original Cypress Hill sound loops. So for instance if you are playing on a multiplayer server you will hear one of these songs, instead of the default Cypress Hill ones, at the end of the map you have been playing. You can download the custom gangsta sounds from here. 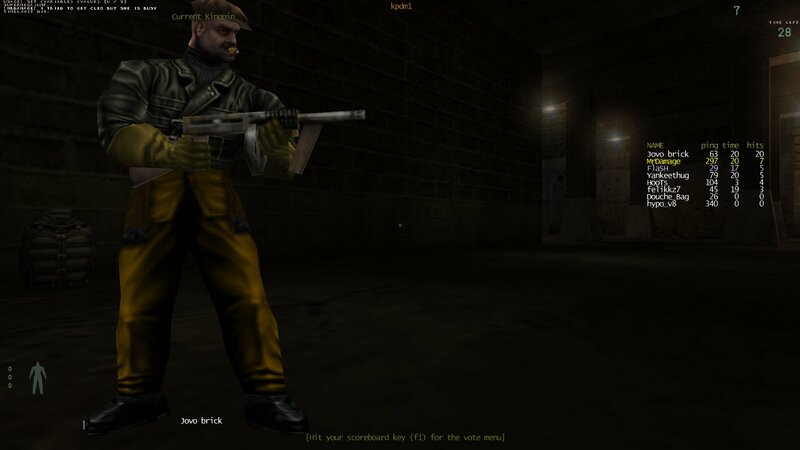 Just extract the pak9 file to your kingpin/main folder. If you already have a pak9 file in your main folder then extract the new pak9 to a temporary folder somewhere and rename it to another number such as pak2, pak3 etc which you don't already have. Then copy it to your kingpin/main folder. This Thursday's game is going to be death match with some realmode thrown in as well. 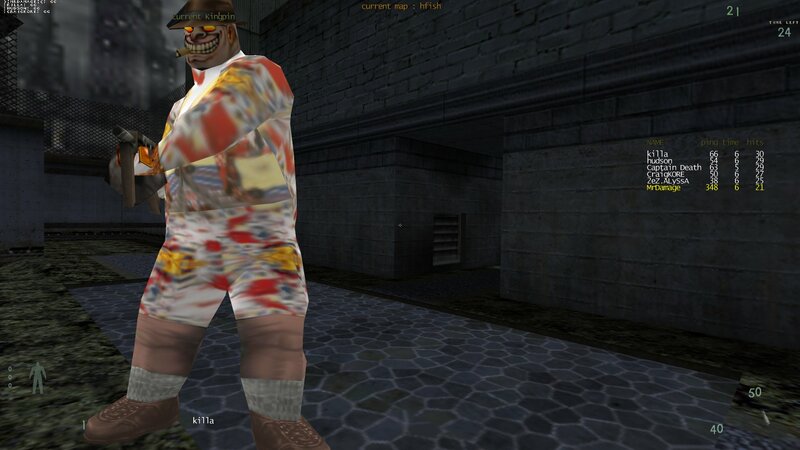 It's a 9pm UK time on the Newskool Fragfest server. Check out the wordclock here to see what time it is where you are when it is 9pm in the UK. 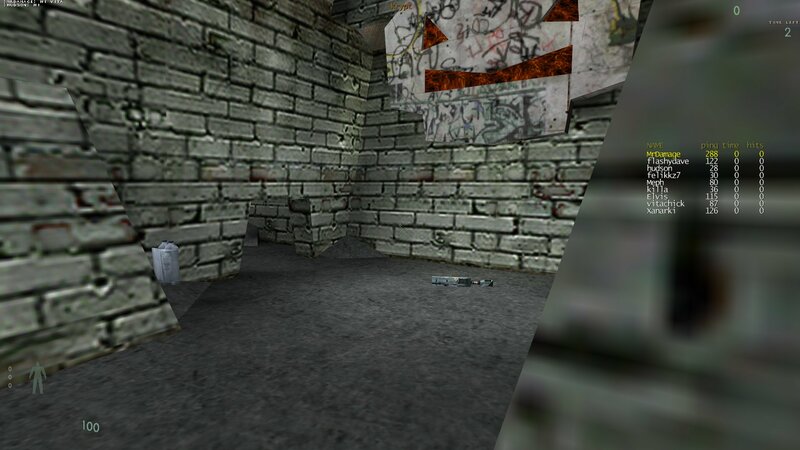 Back in 2002 - 2003 there was a mapper for Kingpin called -Cat. He made very good maps and quickly became one of my favourite mappers. 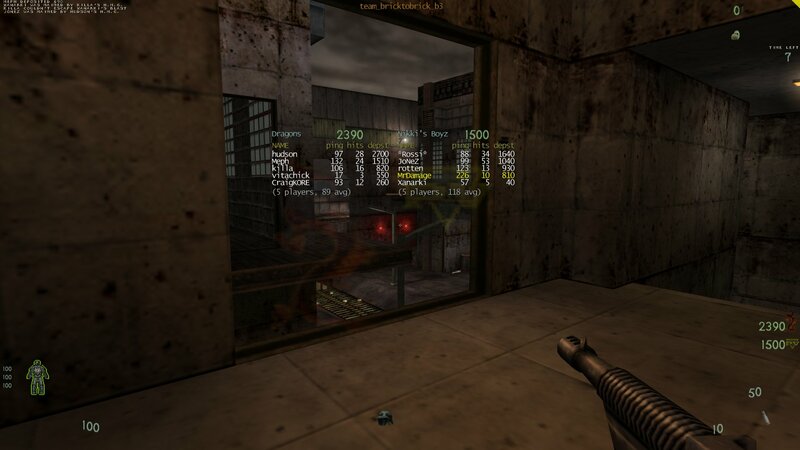 Many of his maps were very large but one of his smaller ones is Warehouse Wars. As the name suggests it is set in a warehouse. 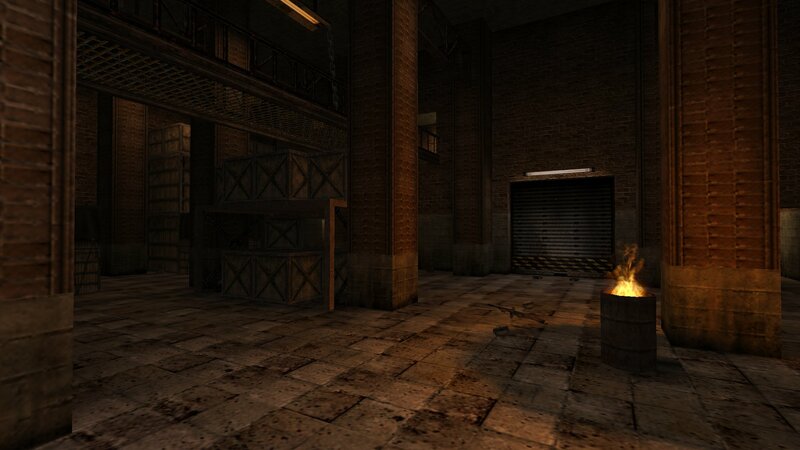 Set in a warehouse, with many weapons + ammo to assist you with your fragging. This is a small map with two main areas. 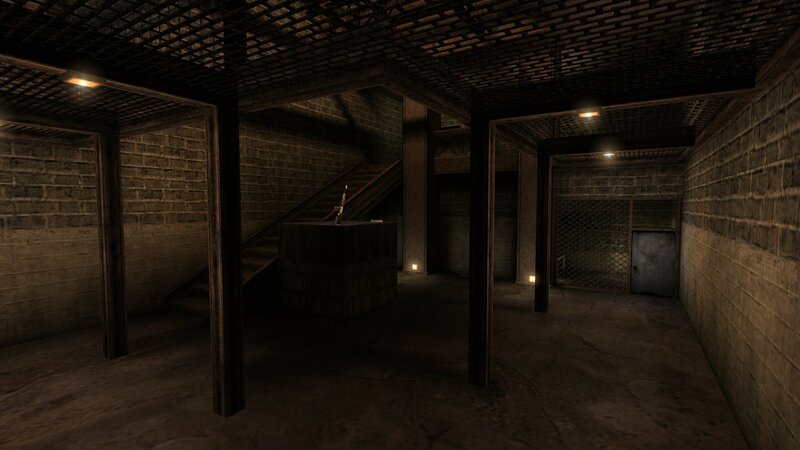 There is an secrete area where you can find an extra HMG and armor, the access point to this place shouldn't be too hard to find among the boxs, but getting there may be a bit trickyer. 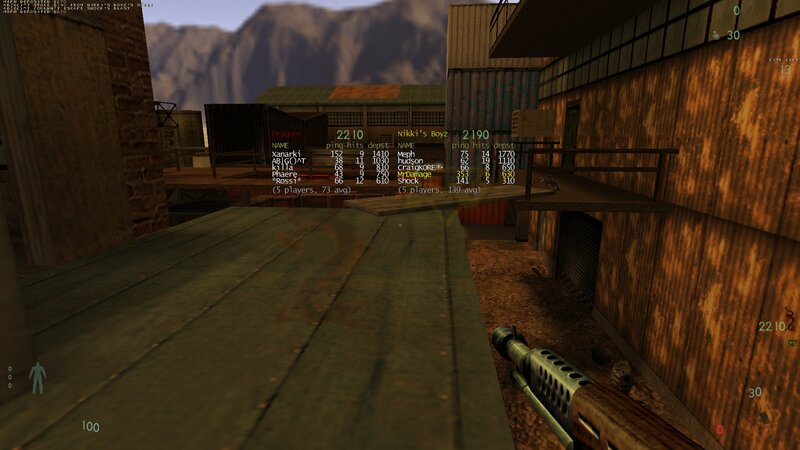 You can download Warehouse Wars (dmcat_ww.bsp) from here. 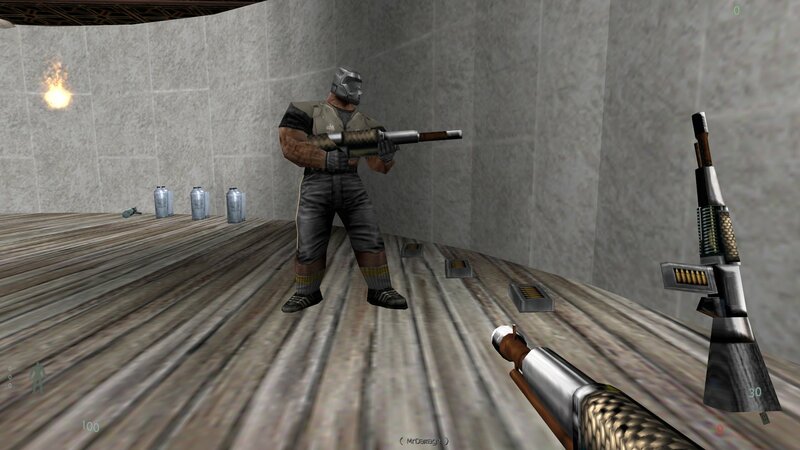 The Sunday Bagman game this week is on Killa's Bagman server starting at 9pm UK time. Bring a big sack to carry all your money! I found some old screenshots from 2012. From Mr Ruler's Oldschool servers and the KP4Ever servers. If you use Facebook and want to see some more screens from 2012 I posted several more in the Kingpin FB group here. Some of the messy carnage from Thursday's game. 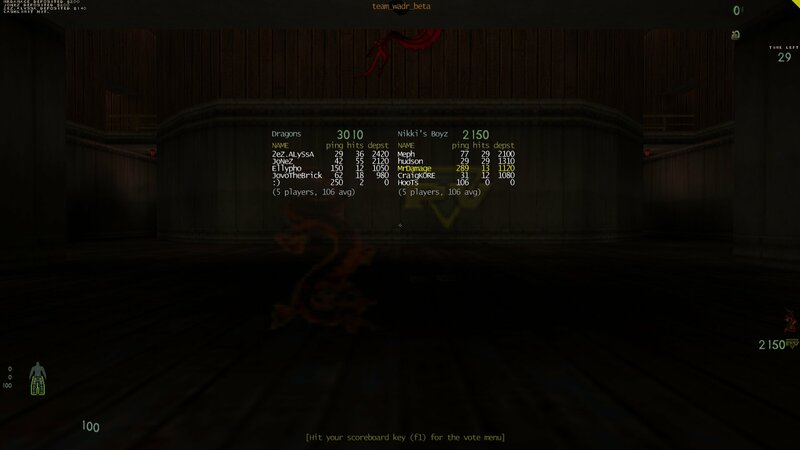 Statics are based on server stats. Txt files will not be includes in count, old files that are updated will be updated with new link. 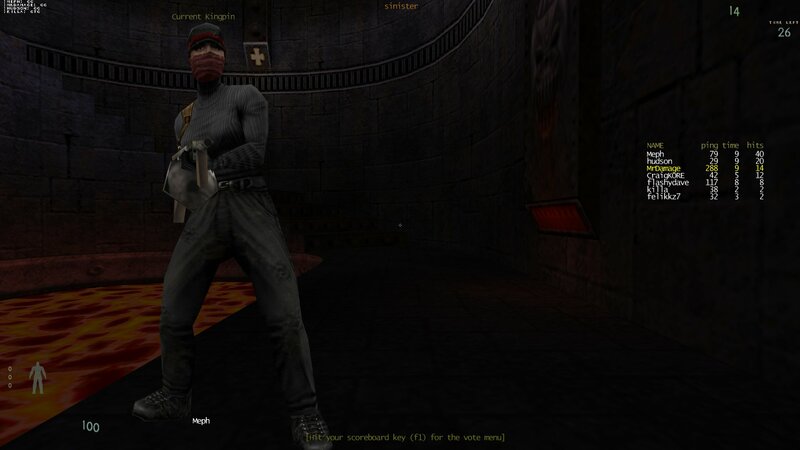 Monkey Harris has changed his Newskool TeamDM server to a Gangbang server running KPDM1-5 maps. It will stay like this for two weeks but could be longer if there is enough interest. 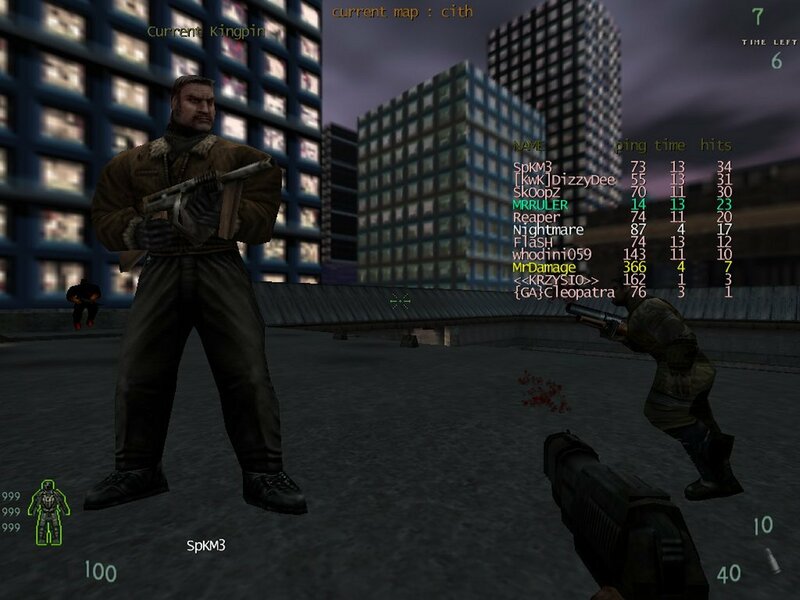 Go and grab some of your oldschool friends and jump in the server. 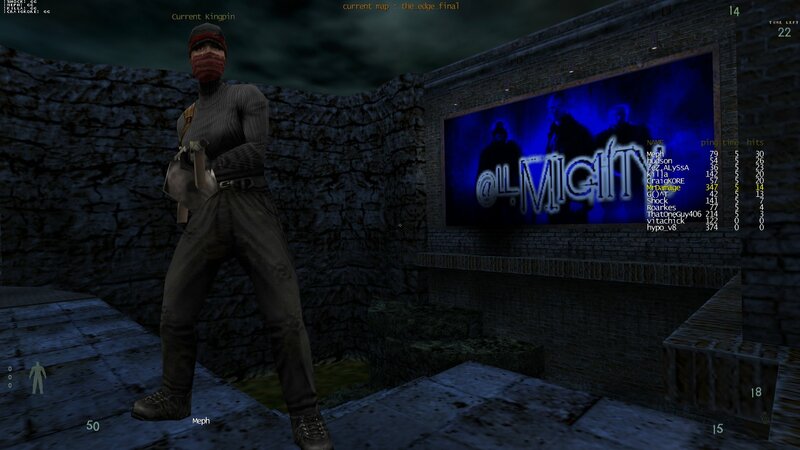 The Thursday game this week is Hitmen mod starting at 9pm UK time, on Killa's server. There may be a little Real Mode thrown in as well. Continuing with my project of putting all the custom weapon skins we host into pak files I have now placed the two greande launcher skins into pak6 files. 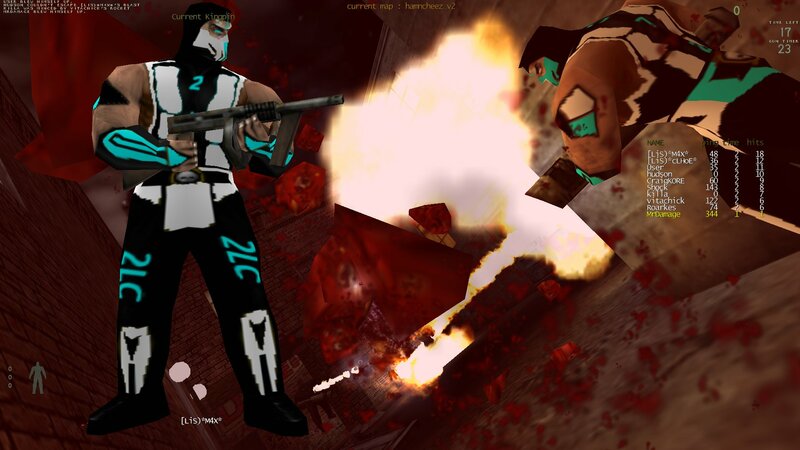 I also included the extra file so you will see the custom GL skin on other players when they are using the GL. The zip files are set up so you only have to extract the pak6 file to your Kingpin directory. 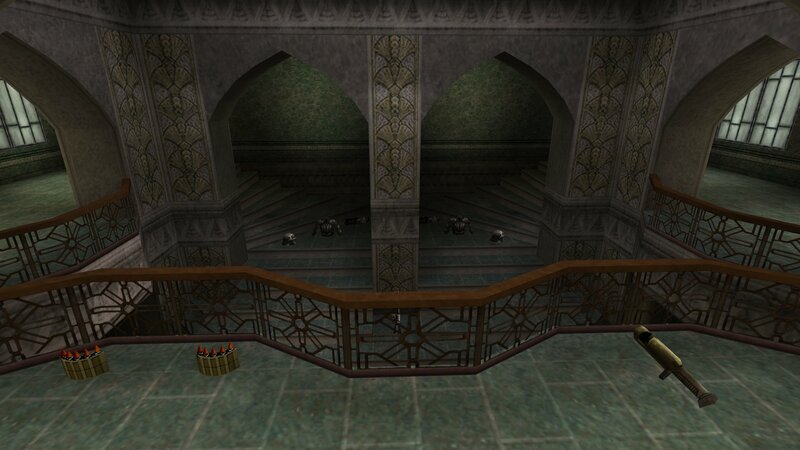 This will place the pak6 file in your kingpin/main folder. If you already have a pak6 file in your main folder then extract the new pak4 to a temporary folder somewhere and rename it to another number such as pak2, pak3 etc which you don't already have. Then copy it to your kingpin/main folder. 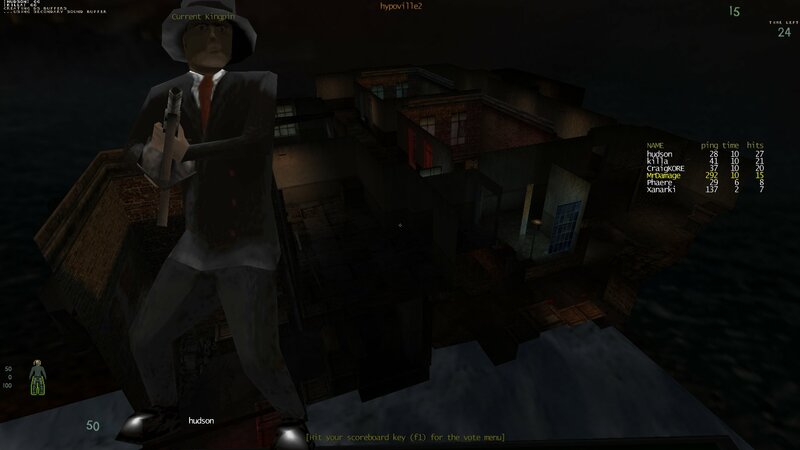 The other original Bagman map that was updated in 2007 is Team Towers. 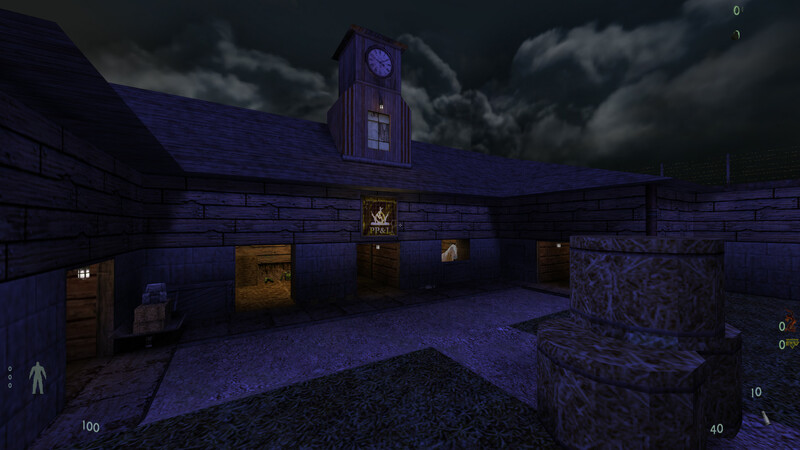 Not being a big fan of the original I am not sure what the changes are but as Monkey Harris has just added this map to the rotation at Newskool Bagman server I'm posting about it so you can download before playing it there. Download Team Towers 2007 (team_towers2007.bsp) from here. The other night I was showing Killa a few maps he might not have seen before. One he liked, and has added to the rotation on his server, is Mephistopholes Lair. 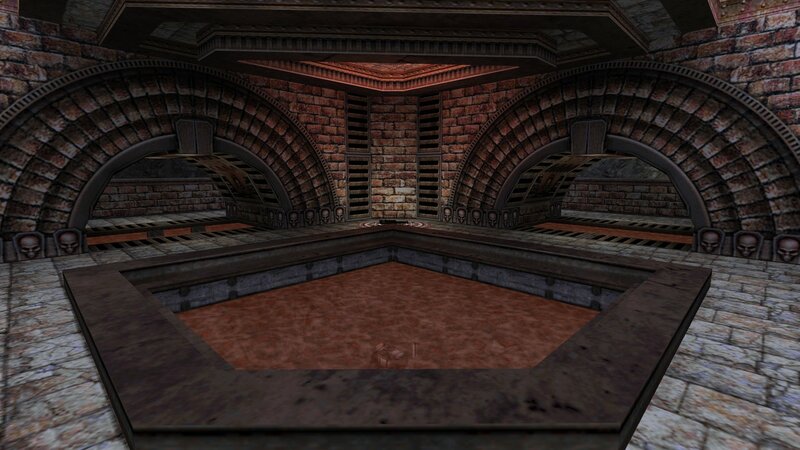 Mephistopholes Lair is death match map converted by me from Quake 2 which was originally created by Monster. 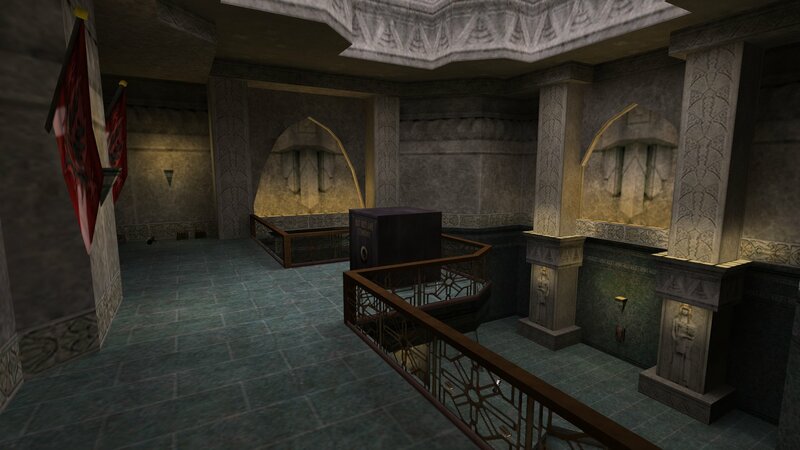 It's a classic style Quake2 map, an ancient structure floating in space, using all custom textures, some custom sounds and a custom sky as well. It features some jump pads and dangerous slime pools, has ample weapons and items and yes if you fall off the edge you'll die. Just extract all the files to your Kingpin folder. I like the original Rival Teams map but the weapon placement leaves a little to be desired (especially the placement of the HMG). 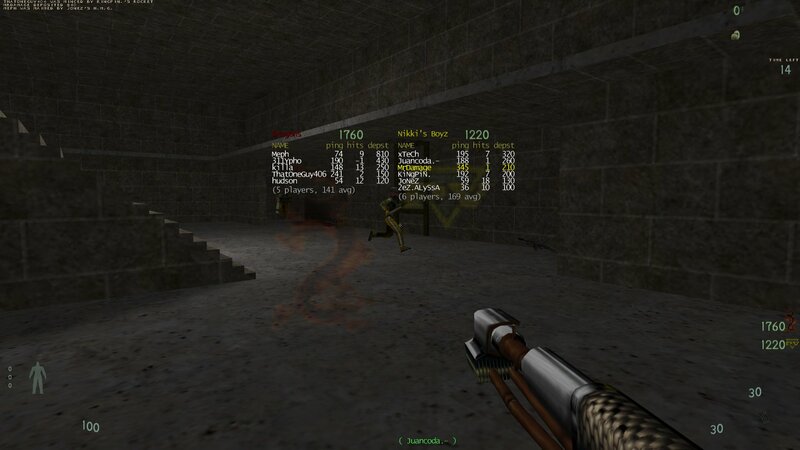 Back in 2007 an updated version was released with better weapon placement that I think people would prefer to play. You can download Rival Teams 2007 from here. 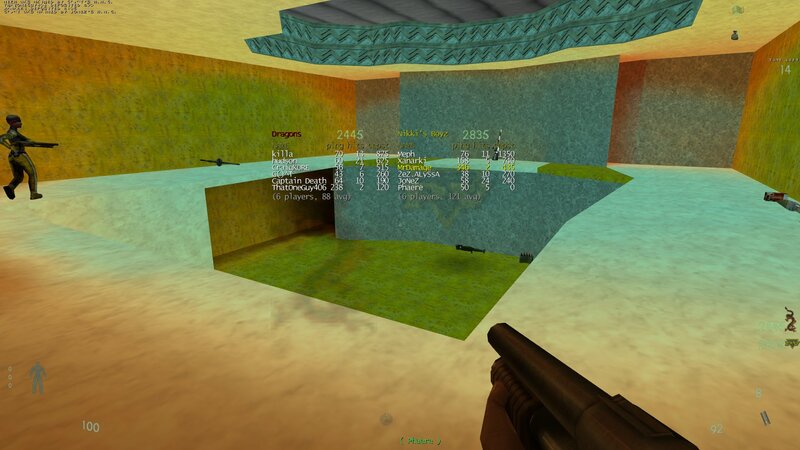 Update 17th Jan. Monkey Harris has added this map to the rotation o nthe Newskool Bagman server. This Sunday's game of Bagman will be on the new East Coast Snitch Slappa server starting at 9pm UK time. This server was only recently setup and this will be the first time it has been given a good workout. AB|Jones has released a Capture the Flag version of the Facing Worlds map. 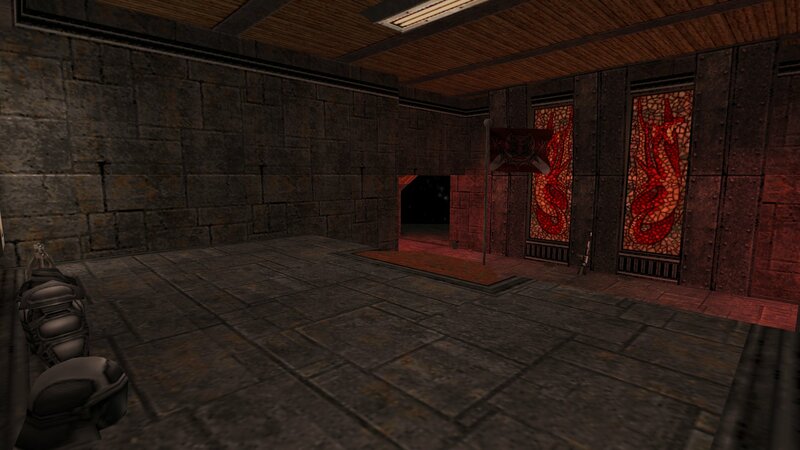 It was originally a popular CTF Map in Unreal Tournament so it makes sense to make a CTF version for Kingpin. 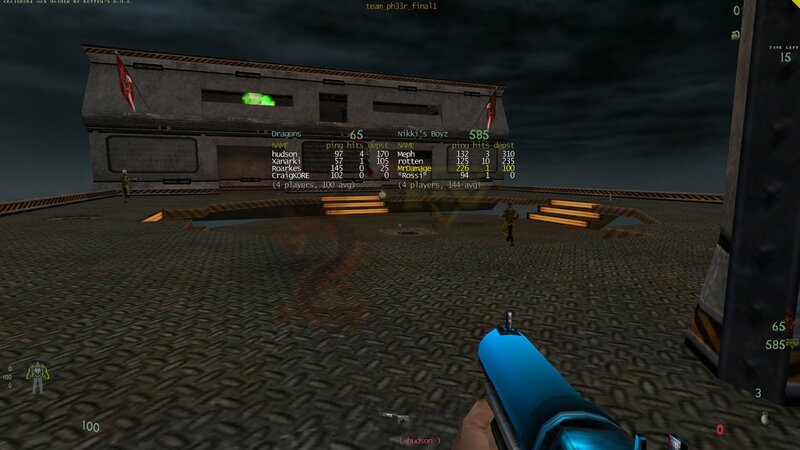 You can download CTF Facingworlds from here. AB|Jones has updated the Team Facing Worlds Bagman map again. He has now got the weapon numbers and placement the way he finally wants it to make the map play the best way it can. The HMG's and Rocket Launchers have moved and more HMGs have been added. He has put the grenade launchers back into the map but it may take you a little while to find them. 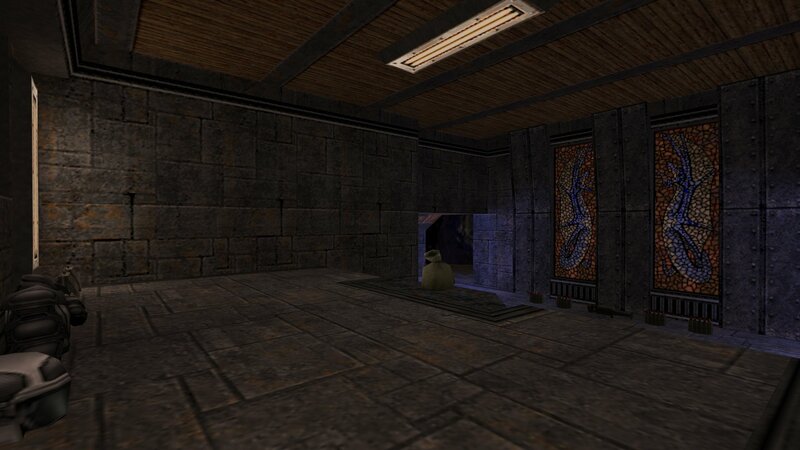 You can download the updated map (team_facingworlds.bsp) from here. 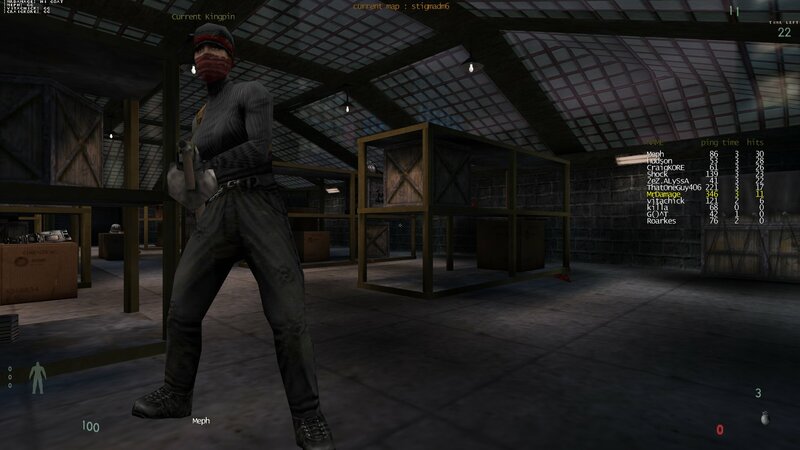 The Thursday game this week is Hitmen mod starting at 9pm UK time, on Killa's server. Ch3w has uploaded, to Youtube, four videos of some of us playing the XMas mod on 29th December. It's a great way to highlight the mod. Monkey Harris has now set up another Kingpin server in the USA. 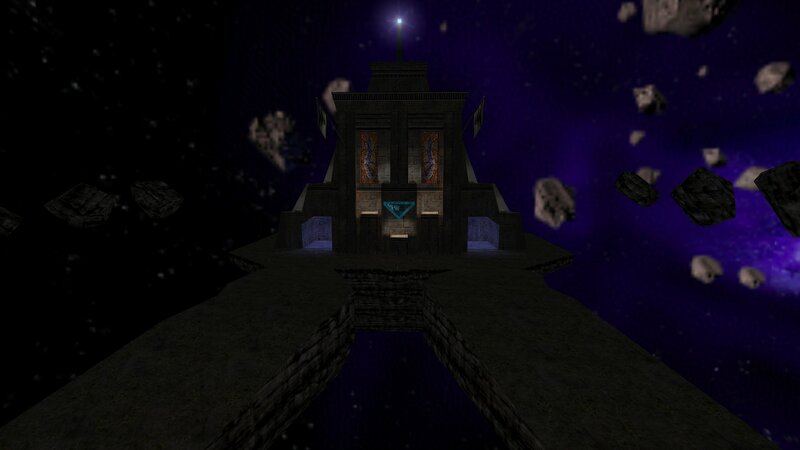 This one is Team Deathmatch and rotates both custom and standard maps. 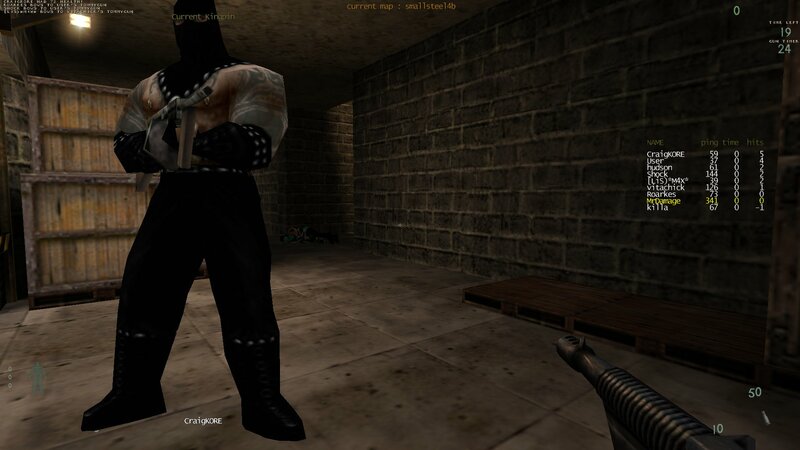 It has electable admin so you can change to standard death match if you want to. I just found a Youtube French Kingpin video called Un problème de Rat? that was uploaded on 8th January and already has over 13,500 views. Some people who have laptops with just Intel graphics have problems running Kingpin. Fredz and Saint Bob found a solution that works for some people. It involves downloading a utility called GLDirect and copying the opengl32.dll that comes with it to your Kingpin folder. Checkl out the details in the Saint Bob post here. Acc is still working on his Build Map Converter utility program which allows you to convert Build Games' maps to Kingpin. 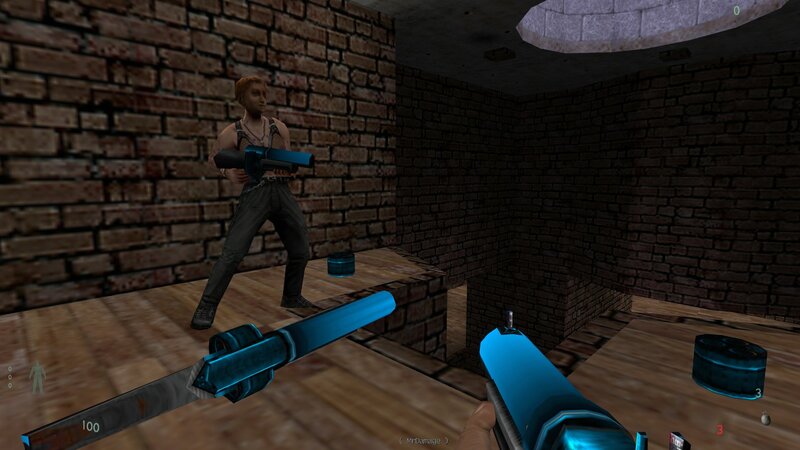 Games include Duke Nukem 3D, Shadow Warrior and Blood etc. Check out latest news here. AB|Jones has the honour of releasing the first new Kingpin map for 2017. It's a Bagman Map called Facing Worlds. 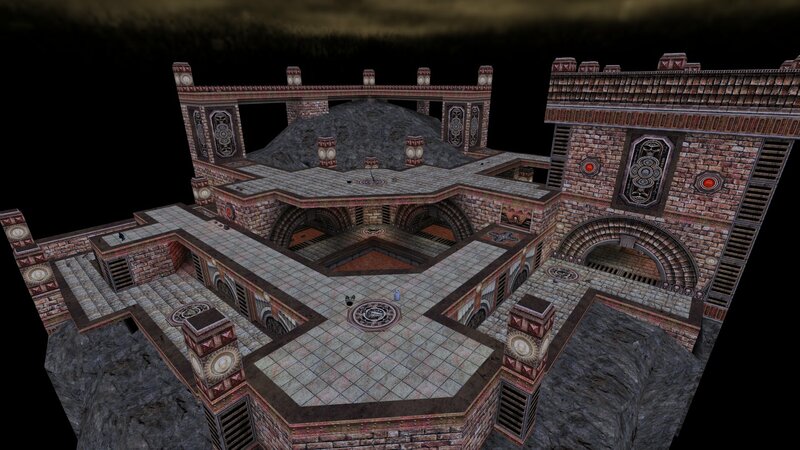 Originally it was a wildy popular Unreal Tournament map. 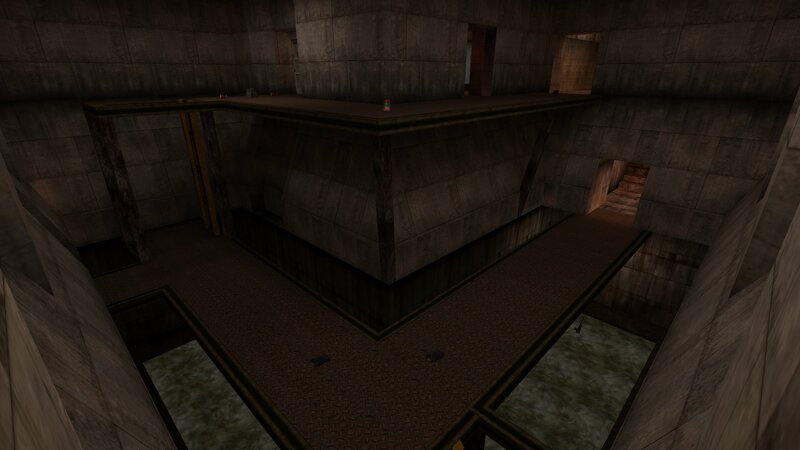 Then it was rebuilt in Quake2 and now it has been converted to Kingpin by AB|Jones. 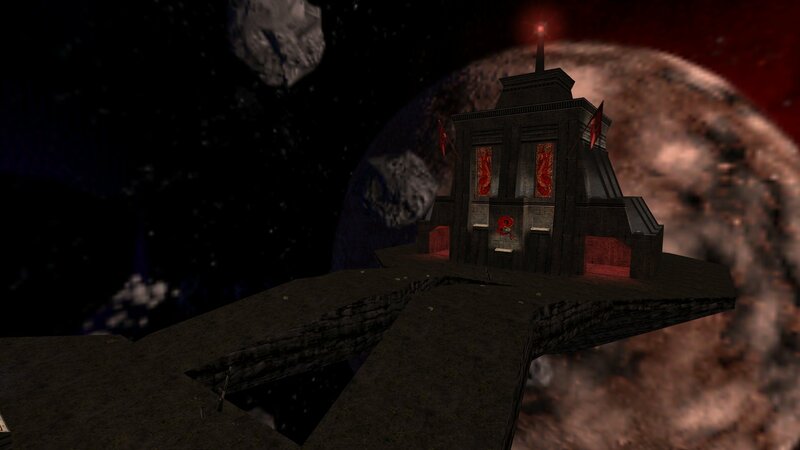 Facing Worlds is a small Bagman map with a space theme. There are two towers which house the team's bases. The bases are separated by two small, inclinded, pathways. The layout is subly simple. 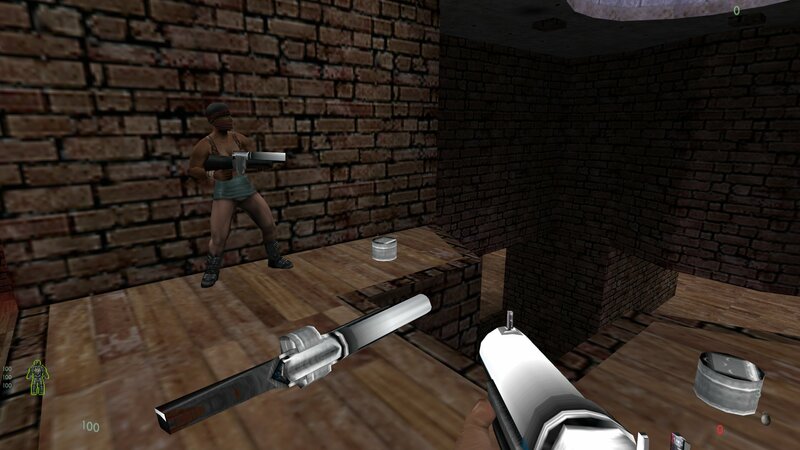 It uses a custom sky and custom textures, has teleports to the roof of the tower where the grenade launcher awaits and there are enough weapons and items to keep people happily fragging. 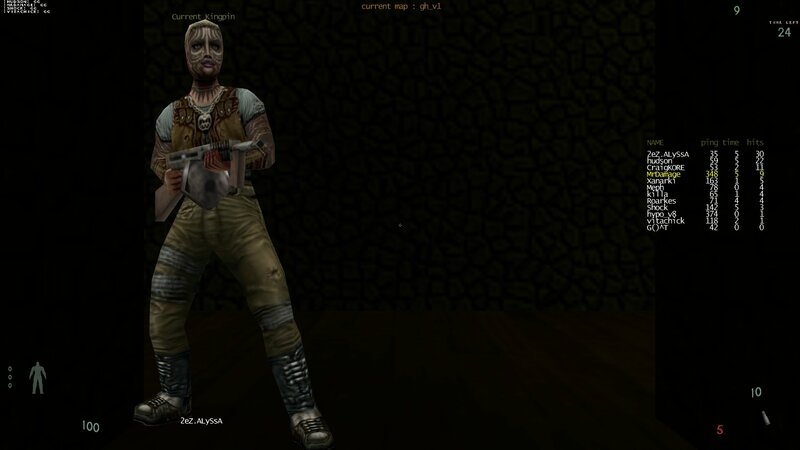 - After playing the map tonight AB|Jones decided to imrove gameplay of the map by making some weapon type and placement tweaks. 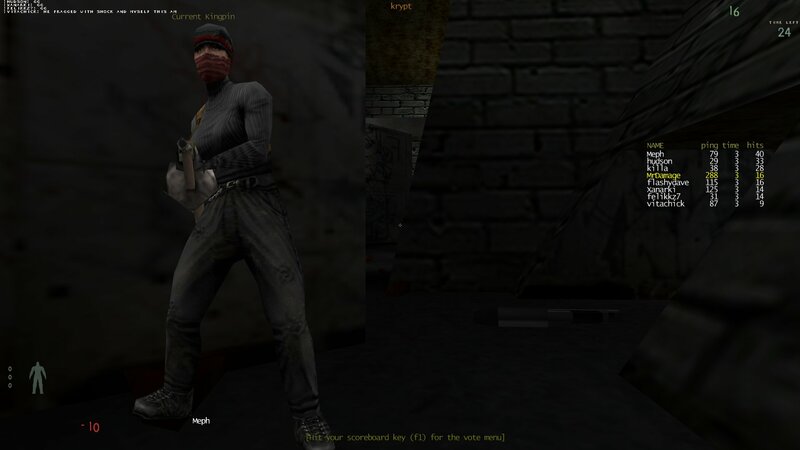 This Sunday the game is Bagman on Killa's Bagman server starting at 9pm UK time. Just a reminder for all you KPers from the USA who are reading this. Monkey Harris is now running a Bagman server running out of the USA. 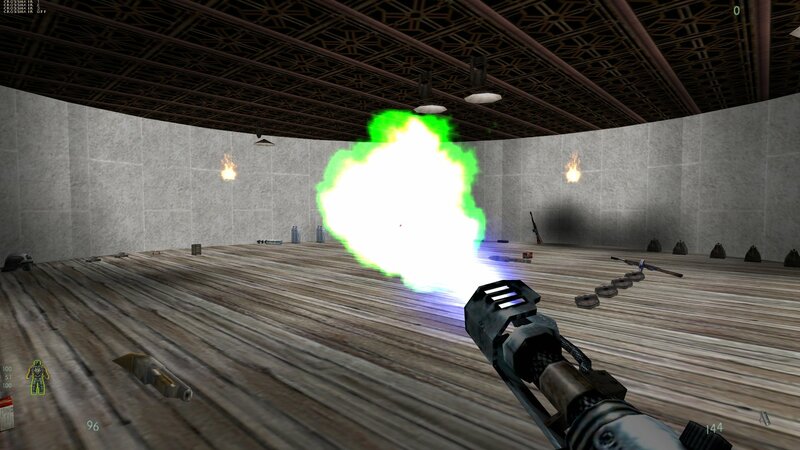 Hypov8 has sent in a pak file which contains green weapon sprites for the grenade launcher, rocket launcher and flamer. 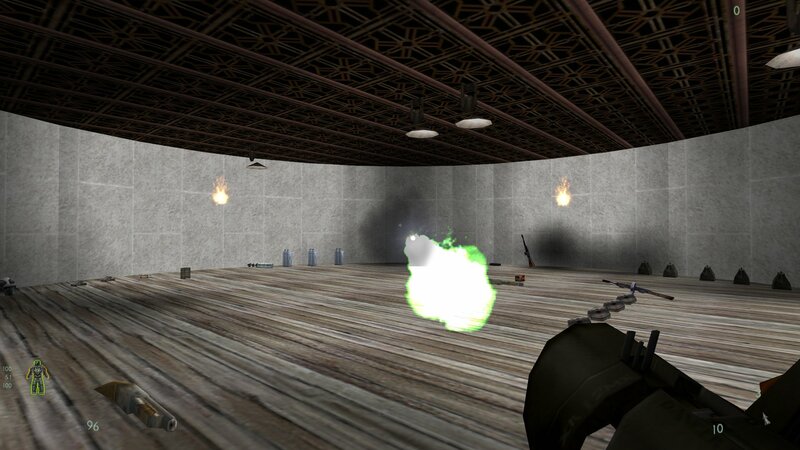 This means that, in game, you see green rocket trails, green flames from the flamer and green explosions when a grenade explodes. You can download Hypov8's green weapon sprites pak file from here. The coloured sprites are in a pak9 file. Just extract/unzip the file to your Kingpin folder. 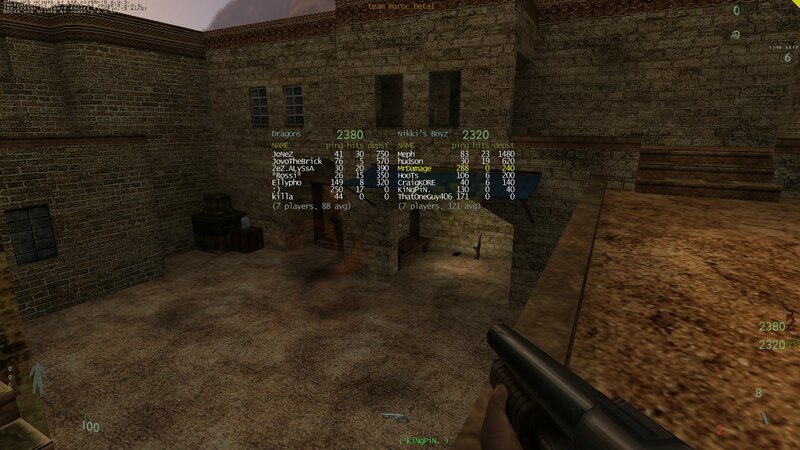 This will place the pak9 file in your kingpin/main folder. Bruis3r has collected all the old clan demos he had and I have uploaded them here. There are lots of demos featuring lots of clans. Clans from UK, Europe, Australia and the USA. Hypov8 has sent me a new custom skin for the HMG. The skin is in pak5 file. Just extract/unzip the file to your Kingpin folder. 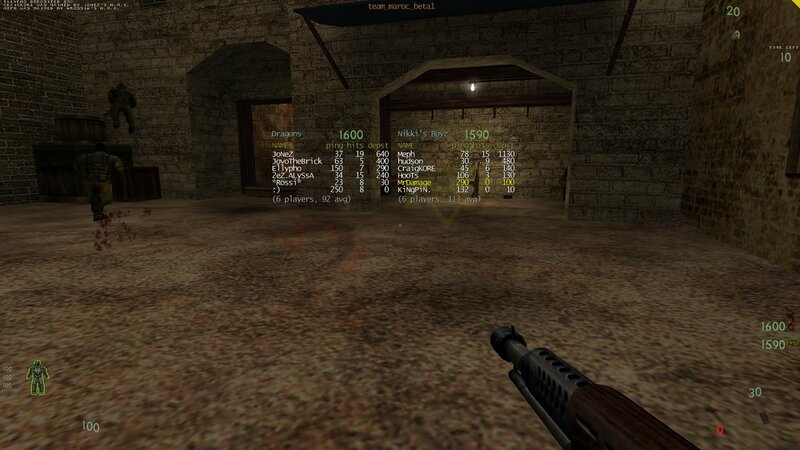 This will place the pak5 file in your kingpin/main folder. If you already have a pak5 file in your main folder then extract the new pak5 to a temporary folder somewhere and rename it to another number such as pak2, pak3 etc which you don't already have. Then copy it to your kingpin/main folder. The two main ones are Gamespylite and [M] Server Browser. 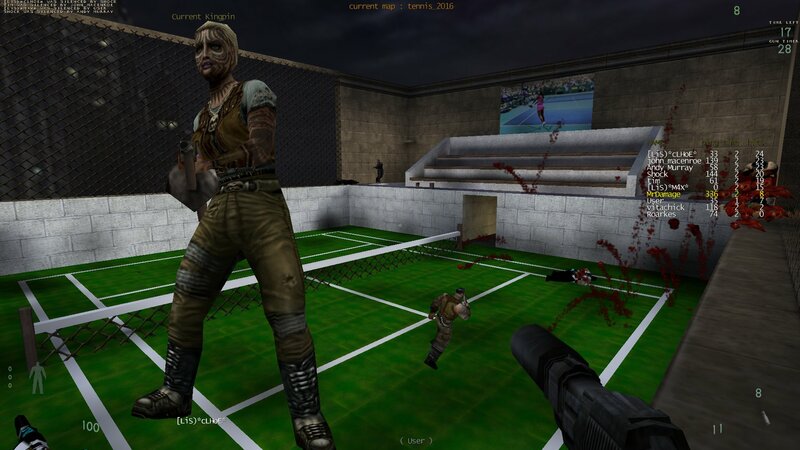 You can download the latest version of Gamespylite from here. Just extract the kingpinspylite.exe file to your Kingpin/gamespy folder (it will overwrite the original one). Some versions of Kingpin don't include Gamespylite so if you don't have a kingpin/gamespy folder just create one and extract the file to there. 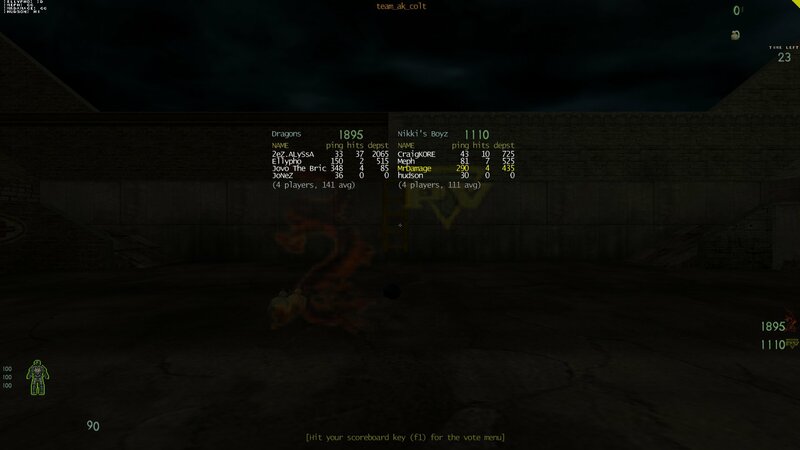 M-Browser by [M] is a Kingpin server browser that is independent from qtracker or gamespy, so it works even when those are down. Check out the readme in the zipfile for install instructions and a list of all the features. We also host it here. 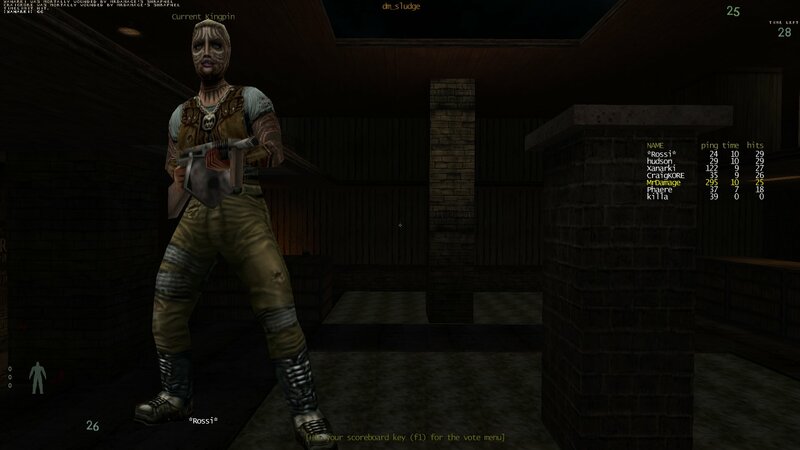 Yes it's time for some good old death match this Thursday 9pm UK time on the Newskool Fragfest server. 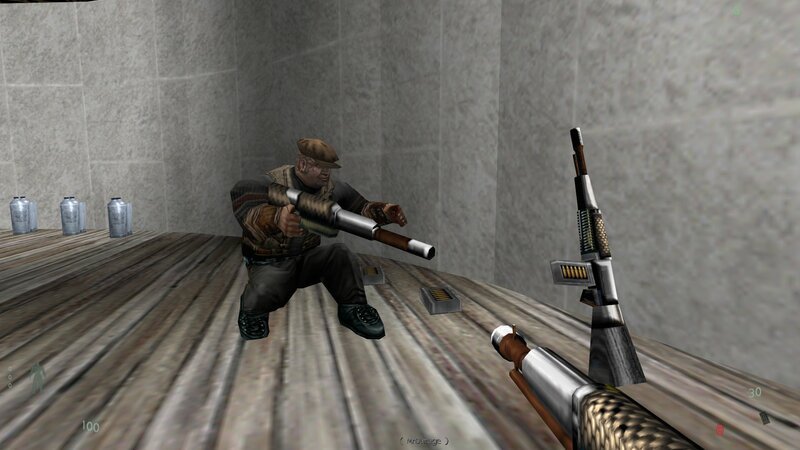 We host four custom shotgun skins. Some of them were in pak files and some weren't so I have updated the ones that weren't and placed them in pak files. They are all in pak4 files now. 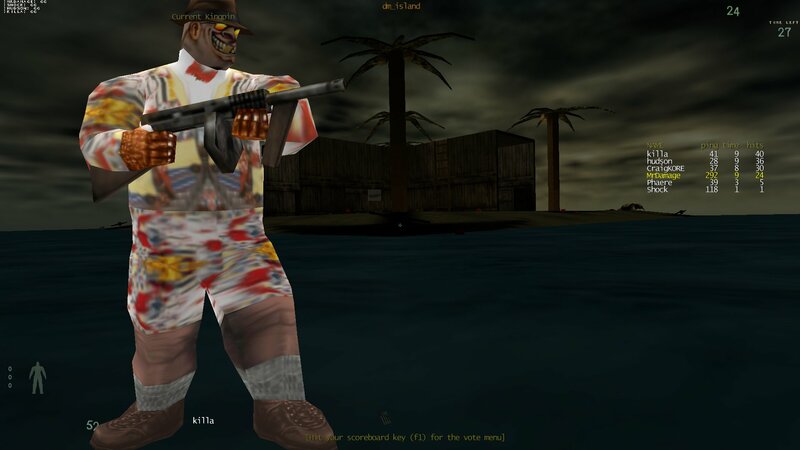 Two of them (cammo and riot skins) only show up on your hud and the other two (mariner and corroded skins) show up in your hud, on the map and on other players when they are carrying the shotgun. The zip file is set up so you only have to extract the pak4 file to your Kingpin directory. This will place the pak4 file in your kingpin/main folder. If you already have a pak4 file in your main folder then extract the new pak4 to a temporary folder somewhere and rename it to another number such as pak2, pak3 etc which you don't already have. Then copy it to your kingpin/main folder. You can check out the custom shotgun skins here. 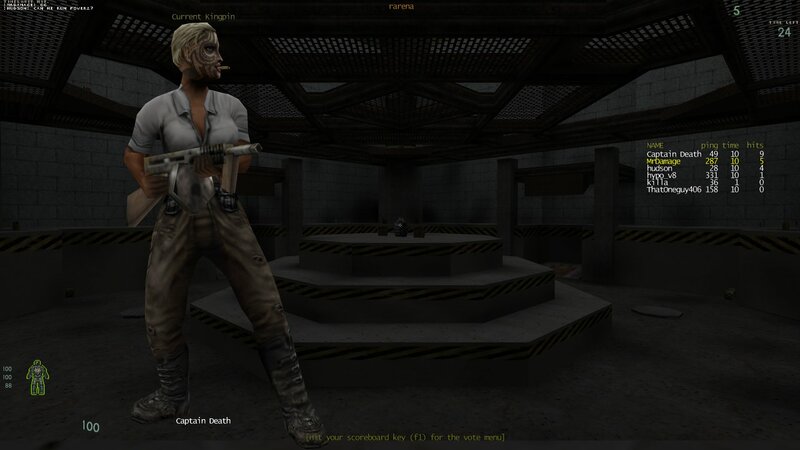 Captain Death has now released the v1.1 server files for both the CTF and Power2 mods. The files are available in both Windows and Linux. 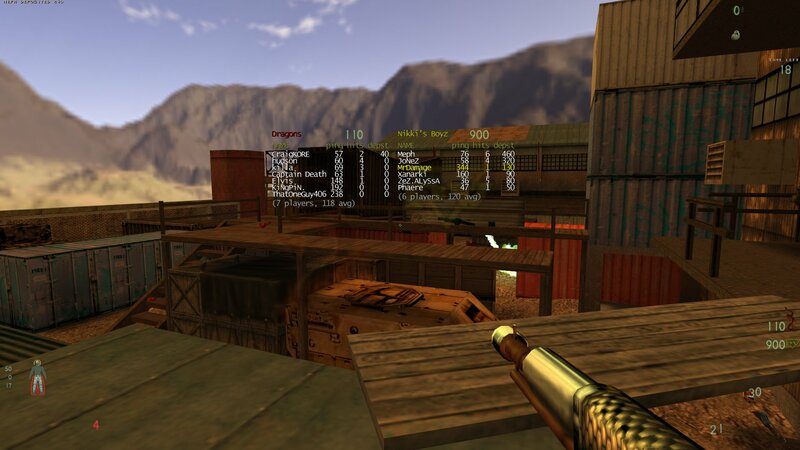 The server files do not contain the relevant CTF and Power2 maps so in order to run a server you will need to download the client files as well. The client files are also available from the links above.